The new Bell & Gossett Series e-1532 space-saving, close-coupled, end suction pump with footed volute has been designed to offer the highest overall efficiencies in the market for HVAC and plumbing applications. With the largest “Efficiency Island” compared to other similar pumps, the e-1532 reduces electricity consumption, improves overall system performance and lowers life cycle costs. This new and extensive product line enables users to maintain significantly higher levels of efficiency over a much wider range of operating conditions. The Series e-1532’s exceptional performance is the result of cutting edge computational fluid dynamics (CFD) design technology, deep hydraulic engineering expertise, and Xylem’s comprehensive knowledge of HVAC and plumbing applications. The Series e-1532 is available in 26 sizes and a variety of configuration options that enables customization and flexibility to fit a broad range of operating conditions. 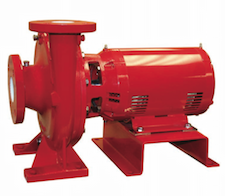 An end suction, close-coupled, foot-mounted pump available in 1.25” through 8” discharge. Motor size 3/4 to 50 HP at 1750 RPM, 2 to 60 HP at 3500 RPM. Stainless steel construction with flows to 2300 GPM, heads to 400 feet. Close-coupled, space-saving economy plus rugged construction make the Series e-1532 the ideal selection for a variety of applications. Available with the B&G standard self-flushing Carbon/Ceramic mechanical seals in 175# working pressure design.